This is a rather small Wetherspoon's just across the road from Tooting Broadway tube station. On Saturday 3rd October we paid a visit and found it pretty busy, with an England Rugby World Cup game playing on the TV. Both the beer (Zinzan World Cup Drop bitter, Welton's Red Rose mild) and food we had were good, and the service was very friendly. As mentioned in several other reviews, this seems like a real regulars' pub, and very cosmopolitan. A nice atmosphere, we thought. This pub is a nice enough Wetherspoons. It has four major areas of clientèle. The total regulars - many Paddies and West Indians but lots of Saxons and Mauritian as well, and all middle-aged at least. Then there's the students from South Thames College (right over the road) and St Georges Teaching Hospital (about a kilometre away). The students don't stay long but they seem to have a lot of fun. There are also a few local shanks. If you smoke you'll be harassed by them outside. They sometimes come inside and be warned they'll try to nick stuff. Also, every Thursday, Springfield Mental Hospital opens its psychopath ward and inmates head straight for Jj Moon's. Don't argue with these guys and gals. They'll eat your hot corpse. Pleasant enough Wetherspoons and seemingly the only one open before 12 noon on a Saturday in the Tooting Broadway area. Service was pleasant. The customers were all men. But they were from a mixture of age groups. Some were watching the live World Cup rugby. 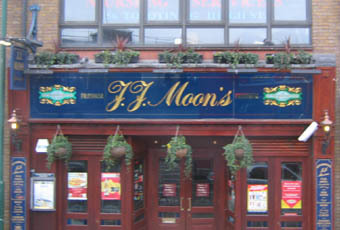 The interior is typical Wetherspoons and is long and narrow. Beers were Maxim Andersons Best Scotch, Hook Norton Flagship, Ruddles Best, Wharfebank Treacle Toffee Stout & JW Lees The Governor. One real cider - Gwynt y Ddraig Black Dragon was also put on for me. Not a bad option for morning drinking in Tooting.